geniaBeana Scraps: Old stuff and new again. Old stuff and new again. I was doing a little reminiscing through my layout gallery over at ScrapMatters and came across one of my first layouts that i posted in the gallery there. It was my first purchase from the shop, too. It matched my photos so perfectly, too. The lettering for the word Clementine was one of my first efforts at alpha making, too. However, I'm pretty sure it wasn't my best work. 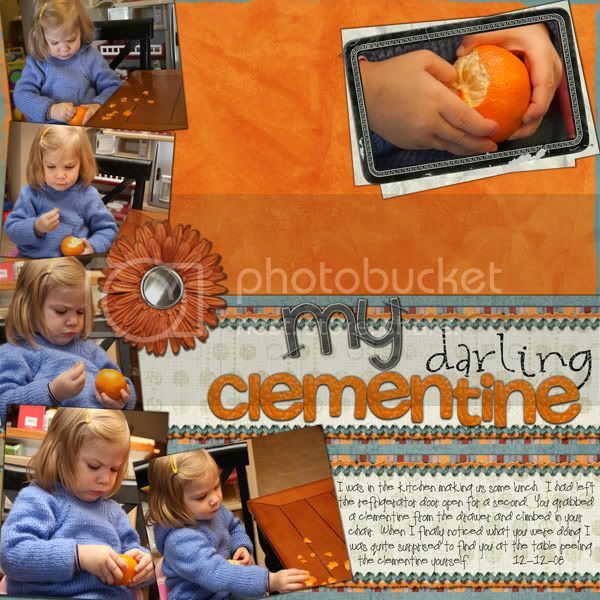 Looking at that layout inspired me to locate the photo I used to make the orange peel letters and create a layer style. I was using PSE5 when I made the layout so I wasn't able to make styles back then, so I'm sure I had an awful lot of fun cutting and pasting the flat photo onto the font I used for the alpha. It was (and maybe still is back in the archives) an early blog freebie. 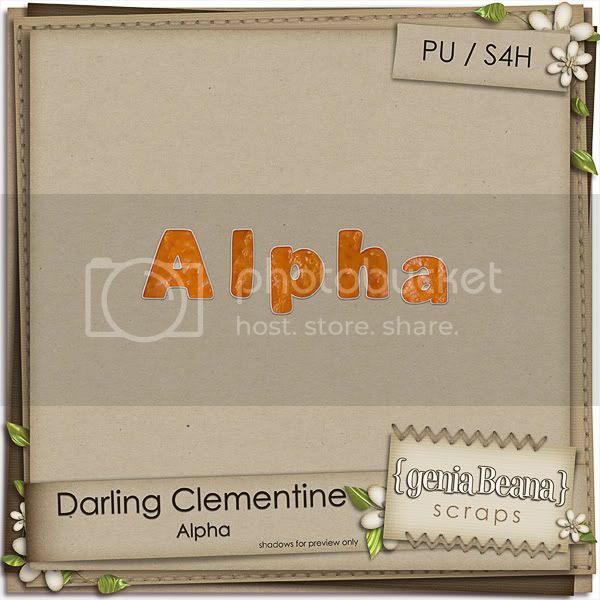 Today I made that layer style, and created a brand new Darling Clementine Alpha to share. It's bright and summery enough you could use it on your layout for the Featured Designer Challenge over at ES this month. If you pop on over to the ES Blog you can grab some bright, summery card stock papers to use as well. If you are on Facebook, you might want to become a fan of my Facebook page, too. I'll be giving out some coupons and freebies over the coming weeks to my Facebook fans. I'm on Twitter now, too, if that is your thing. I hope you are having a great weekend and I'll be back soon with some sneaks of my color play for June at ES and another freebie or 2. Thank you so much for this post. I want to let you know that I posted a link to your blog in CBH Digital Scrapbooking Freebies, under the Page 7 post on Jun. 06, 2010. Thanks again. It's the ES Summer Blog Train! New Release Monday at ES! A few more days left of secret savings at ES!